The less you worry, the easier it will be. An upcoming visit to an oral and maxillofacial surgeon can be a potential anxiety producer. Patients are usually most concerned with possible pain — whether the procedure is going to hurt. Modern technology now makes it possible to perform complex surgery in the office with little or no discomfort. Knowing this should start to bring your anxiety level down to a minimum. 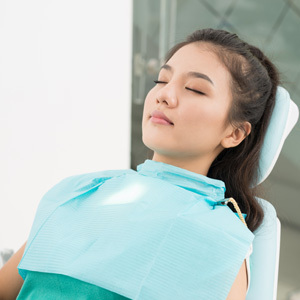 The surgeons at our practices are specialists in dealing with problems of the mouth, teeth and jaws, and are also experienced in dealing with the control of pain and anxiety. During years of hospital training, our doctors have received extensive schooling in medical and dental aspects of anesthesia. We are thoroughly knowledgeable in pain and anxiety control and possess extensive clinical experience in anesthesia techniques, from local anesthesia (Novocaine) to sedation to general anesthesia. As a result of this specific training in anesthesia, our surgeons are experienced in evaluating patients for anesthesia; administering anesthetic; and monitoring post-anesthetic patients. In addition, all our doctors must comply with Massachusetts state rules and regulations on anesthesia administration. Our doctors realize that one way to ease your anxiety is to make patients aware of exactly what to expect during surgery. The more you know about the procedure the less you have to be anxious about. That’s why beforehand, you’ll review your case with your surgeon. You’ll go over types of anesthetic to be used, as well as they way you’re likely to feel during the operation. During surgery, one or more of the following is used to control pain and anxiety – local anesthesia that numbs the surgical area, nitrous oxide-oxygen (laughing gas) for analgesia to relax you; intravenous sedation for increased relaxation; and general anesthesia that puts you to sleep. Our surgeons are specifically trained and experienced in the administration of all aspects of anesthesia and the treatment of anxiety. They have received extensive training in anesthesia throughout their four or more years of hospital-based residency and are able to provide the anesthetic that is most appropriate for you. Each of our doctors is adept at handling complications that may arise from the administration of anesthesia. A complete health/medical history will be taken on patients who wish to have general anesthesia. Providing there are no significant allergies or health problems that might affect the administration of anesthesia, we can provide this service to most people. How Do I Prepare for Anesthesia? Clothing- Wear loose, comfortable clothing with sleeves that can be easily rolled up. Transportation- Arrange to have someone accompany you to your surgery appointment, drive you home afterward and stay with you until the effects of the anesthesia have worn off. Driving yourself home after anesthesia is unsafe. Diet- DO NOT EAT OR DRINK FOR AT LEAST 8 HOURS PRIOR TO SURGERY. Medications-Adhere to any medication schedule prescribed by your surgeon prior to surgery.